Yesterday was a harvest day, of sorts. It's one of those days when I become present to just what I've done by planting those little tiny seeds in pots back in February, or March. This year, I wondered if I should even do it at all, since we are so busy with our house. I am definitely distracted from our house during my Ella-free time by the need to put food up. But I can't really help myself, because when I contemplate the alternative, eating food that someone far away grew, I just can't quite stomach it. I truly prefer growing my own, and immensely enjoy the satisfaction of watching it emerge, bulge into ripeness, and disappear into my body, my cells becoming the very land we live upon. So no regrets here. Quite the contrary, I feel like dancing a little jig! I'm glad I did harvest yesterday, because today it is raining and some of my produce would have been set back a little. Once again, my instincts told me to do it. I didn't realize the rain was coming. I was just guided to harvest. I continue to find that those little voices are worth listening to. 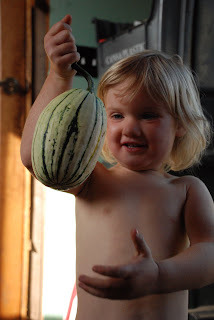 Ella and I descended into the garden with cardboard boxes, scissors, and clippers, picking ripe tomatoes, a flat of tomatillos, a bucket full of Bingo beans (like pintos), and about 13 delicata squash. I also canned some zucchini relish, something I've never done before. It's a recipe Deva likes to use. It's basically pickle relish, with zukes instead of cukes. What was so remarkable about the experience for me was that I grew all the produce: the onions, zucchinis, and the peppers. Usually, if I want to make something like that, I need to buy at least the onions. But not this year! It feels like a milestone for me. There are a lot more tomatoes still to ripen, and more tomatillos than we could possible use or can. 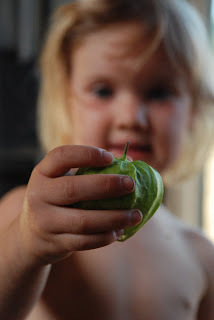 In fact yesterday I gave the tomatillo plant the name of "The Giving Tree". It just keeps on giving, and at this point, I'm confident we will never need to plant them in our garden again. I kept thanking the spirit of that generous plant, for giving us material to make salsa and enchilada sauce! I just peeked in today after a long absence. Your life is beautiful. So much is going on in your part of the world. It must feel so amazing and exciting and just, ah….